Upper: Mesh, fused synthetic, closed-bootie sleeve construction, Flywire cord-based lacing. 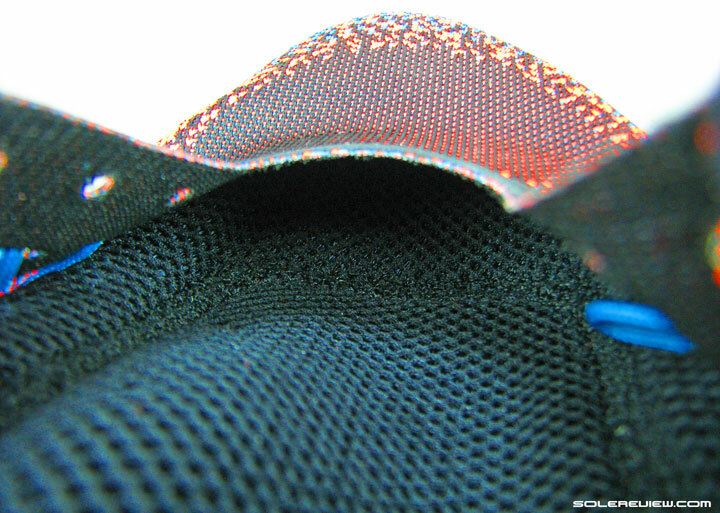 Midsole: Dual-density midsole; Lunarlon layer bonded to EVA foam. 4 mm heel offset. 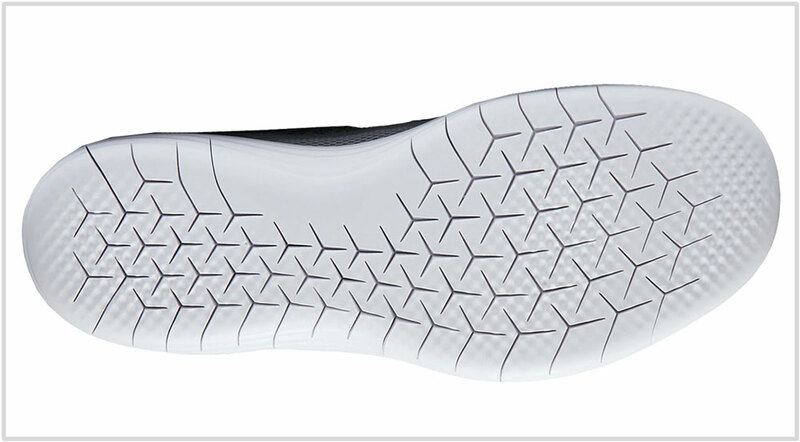 Outsole: Exposed EVA foam with flex grooves. The Free RN Distance 2 comes with a surprisingly high number of updates, right from the changed quality of the upper fit to the overhauled outsole geometry. That said, it remains the cushioned Nike Free it was last year. The first Nike Free made landfall in 2004, and this is perhaps the first time we don’t see a numbered Free model in Nike’s running assortment. For a long time, Nike models were differentiated by the numbers attached to their names. A 3.0 suffix meant that the shoe was more minimal and flexible than other Frees; the 5.0 number meant that the shoe was half way between a fully-flexible concept and a daily training shoe. We see none of that in 2017, which is a sign of the market’s evolving tastes. 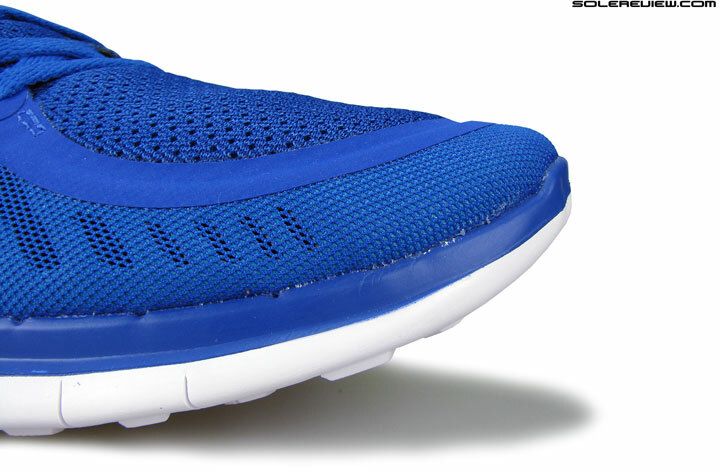 Most of the Nike Free models today are relatively built-up versions of what they used to be once. There’s a lot more structure, lower flexibility, and upper designs which are a closer match to the rest of Nike’s non-Free shoes. And yes, the ride has progressively turned softer too. Last year’s Free RN Distance was the softest in Nike Free’s history. 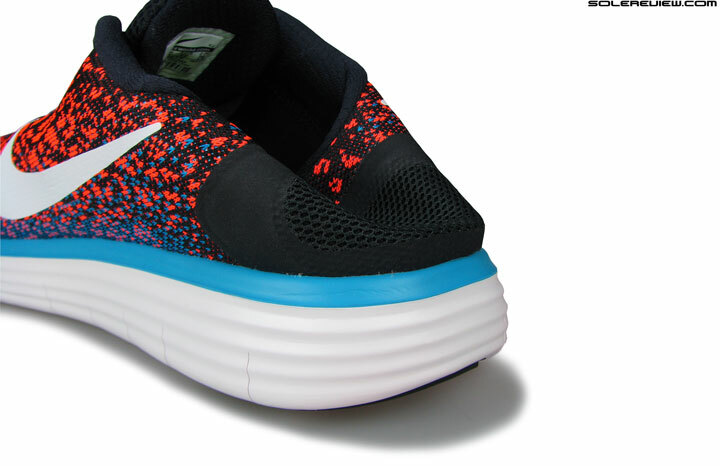 The removable insole was made of cushioned blown foam, and the ride was further softened by the additional layers of the lasting and the Lunarlon portion of the midsole. 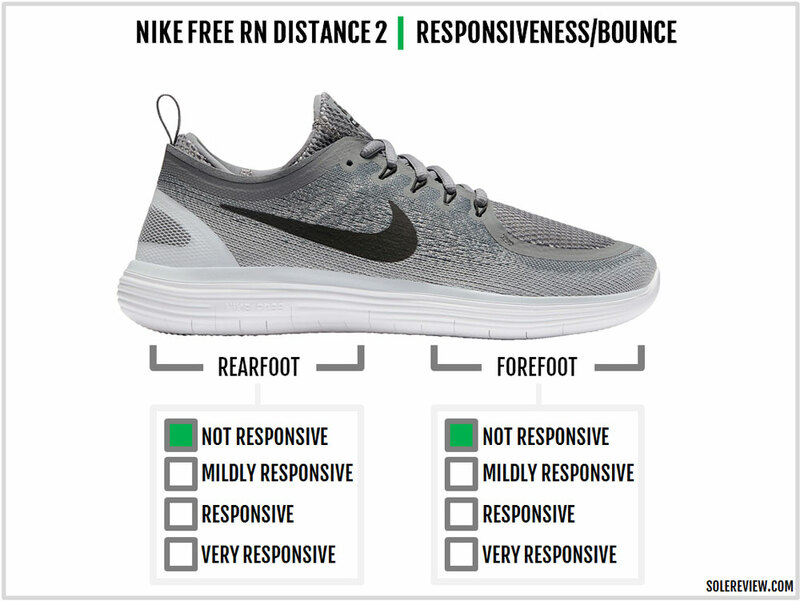 In essence, the RN Distance concept was a more palatable, softly-cushioned design interpretation of the otherwise minimal Nike Free platform. Hypothetically speaking, if the RN Distance had a number, then it would be called the Nike Free 8.0. The Distance V1’s upper had an unusual design. The inner sleeve was completely independent of the outer upper and extended right up to the toe area. In other words, the RN Distance’s upper was made of two separate layers, and this resulted in a very snug and warm fit experience. The 2017 Nike Free RN Distance 2 might sound like a mild design update, but it’s a lot more than that. The upper design changes completely, and so does the outsole geometry. 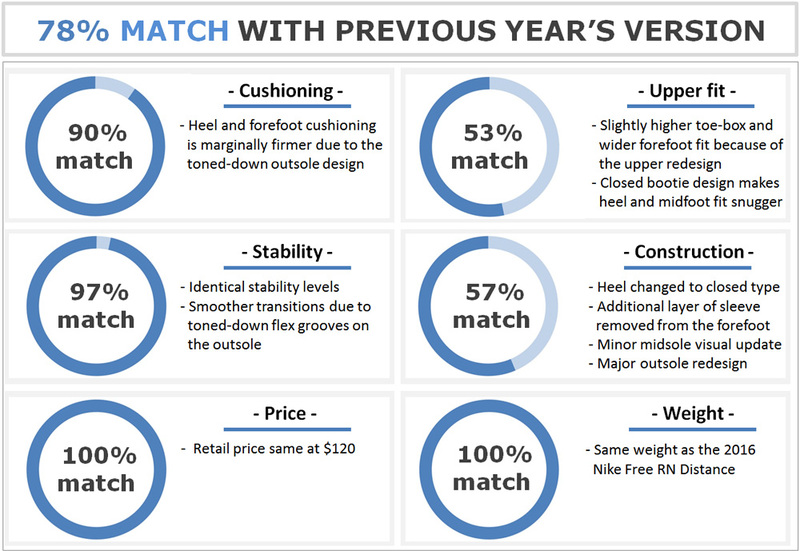 As a consequence, the upper fit and midsole ride quality are beneficiaries of significant changes over last year. If you’re an existing owner of the previous Free RN Distance, you’ll be surprised by how different the new upper design is. On first appearances, the RN Distance 2 has gained a lot of external layering. Whereas the RN Distance 1 had an external upper made of a (nearly) single-piece mesh, the Distance 2 introduces fused layers and external panels. The forefoot has fused synthetic running over it, and the midfoot is a separate panel altogether which also extends to the heel. The design influence of the Nike Free 5.0 is strong on this one; the manner in which the fused synthetic snakes its way on the forefoot and midfoot is very similar to the 5.0. The lacing uses Flywire cords like the Free 5.0 and Distance V1, except that there are three columns instead of last year’s four. The opening of the RN Distance gets a huge makeover. The entrance is now a closed-bootie construction, which means that the tongue and the heel are a part of a closed loop. This is very different from the RN Distance 1’s design which split the tongue and the heel into distinct components. However, the Distance 2 makes some puzzling design choices, like including two flat lock seams on either side of the heel interior. Not an ideal place to have seams, is it? The heel exterior gets a lot more structure with the synthetic wrapping around the rear. There’s also a pull tab which wasn’t there on the last year’s upper. The Achilles is well insulated from the stiffness, though. Neither the synthetic or the pull tab come in direct contact with the foot. Nonetheless, you won’t get the collapsible heel of the RN Distance V1. Reflectivity is the same place where the Distance left it last year. A small strip is printed over the heel, and the side Swoosh logos can be reflective (or not) depending on the color. Regardless of the newly acquired visual heaviness, the Free RN Distance 2’s upper differs from the Distance 1 at a fundamental design level. The Distance 1’s upper had two separate layers. There was a sleeve which began at midfoot and then went all the way up to the toe area. It’s not so this time. 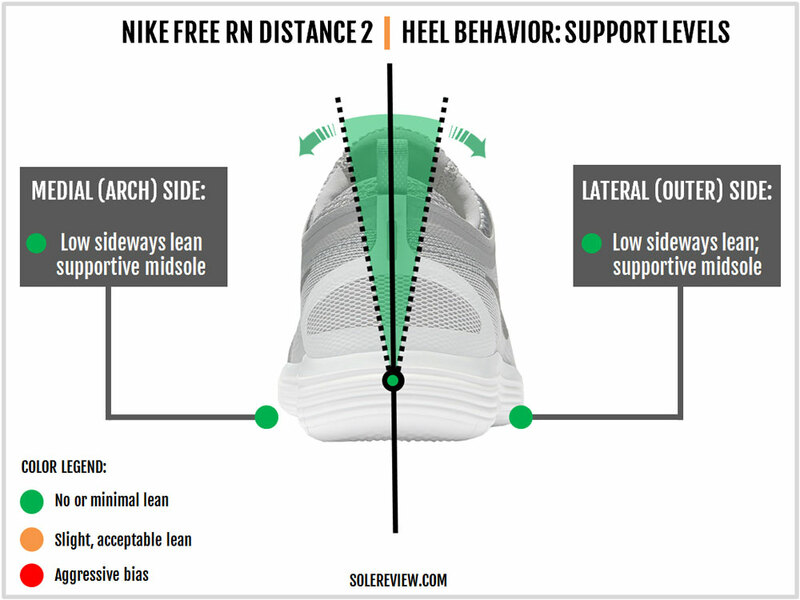 The heel and the tongue might be integrated, but the mid and forefoot are now a part of a single upper layer. The forefoot now lacks the second sleeve layer inside, and obviously, this influences the fit quality when compared to the Distance 1. The upper also breathes better than the last version. The upper isn’t the only beneficiary of radical design updates. The RN Distance 2’s outsole is reworked from the ground up, with resulting changes in ride quality. 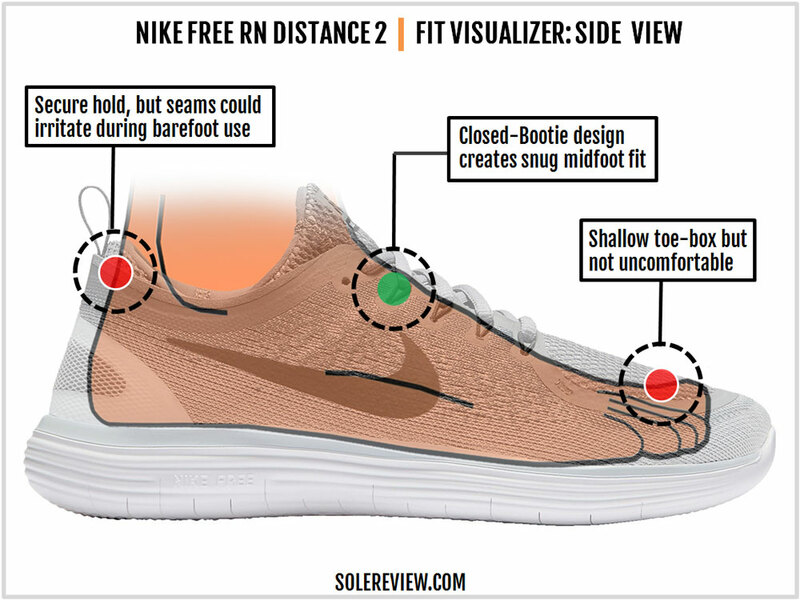 While the dual-density stacking of soft Lunarlon foam and the firmer EVA below hasn’t changed, where the RN Distance 2 differs from the V1 is in its outsole design. 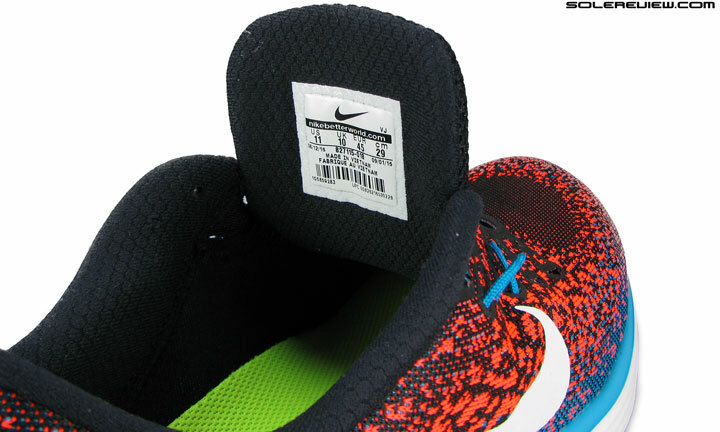 The V1 used an outsole similar to that of the Free 5.0. The layout was a colony of hexagonal pods separated by very thin and deep grooves. Rubber pieces were used under the toe and heel edges, areas which are perceived to be high wear. This year’s RN Distance tones down on the flexibility factor and replaces the hexagons with windmill-shaped cuts of a lesser depth. The new outsole comes without the rubber pieces, and the inner midfoot has no grooves at all. The entire geometry is 100% EVA, the same material which makes the lower midsole. 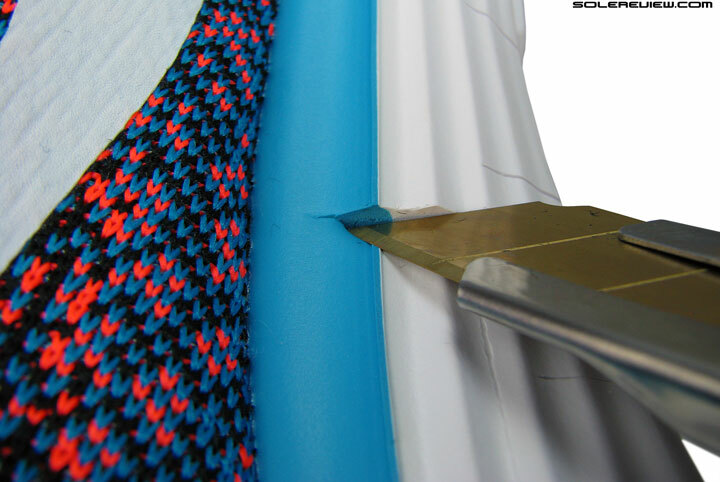 Cutting down the flex grooves also decreases the V2’s outsole grip to a certain extent. The medial midfoot is made of solid foam, and so are the heel and toe edges. The generously siped heel edge of the V1 also served as a flexing crash pad of sorts, and that’s a feature which the V2 no longer has. These updates make the Free RN Distance V2 noticeably less flexible than the V1, and a bit firmer too. The upper layers of cushioning stay the same. The V2 has the soft removable insole, the foam lasting, and the superficial Lunarlon midsole layer. The bright side is that the V2’s redesigned outsole has a lower tendency to trap debris than the V1. Regardless of its rubber-less construction, the RN Distance’s outsole should last for around 300 miles or more. The Nike Free foam compound has proven to be surprisingly hardy over all these years, with durability being at par with rubber-clad outsoles. Expect no sudden surprises with the upper either. 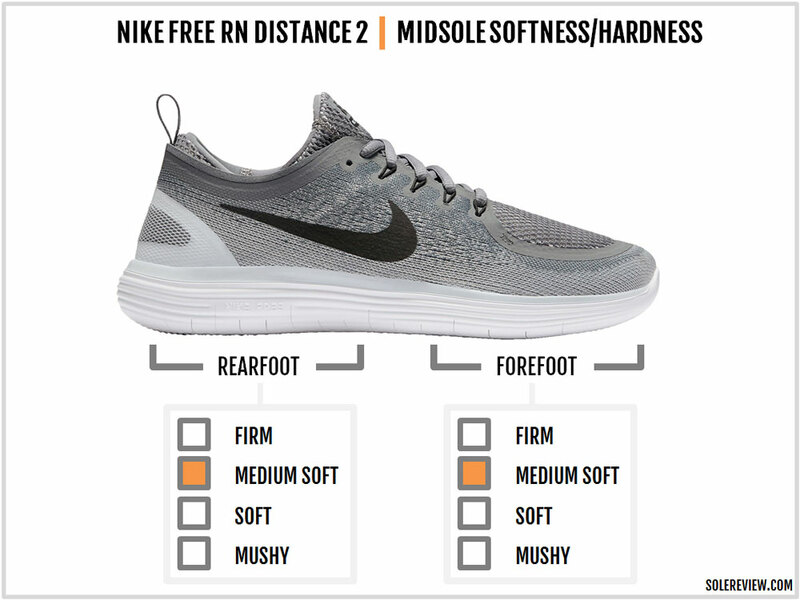 The fused layer construction has been used in previous Nike Free models without any concerns, and in all likelihood, the RN Distance V2’s upper will outlast the foam midsole. That said, expect a cushioning degradation of both the blown foam insole and the Lunarlon portion after a few hundred miles. It would appear that the additional layering over the Distance V2’s forefoot would make the toe-box fit shallow. Well, while the toe-box doesn’t exactly have an abundance of vertical room, the toe-box is less shallow than the V2. How so? The V1 had an internal sleeve leading all the way to the toe tip, and this reduced vertical room. With the inner layer gone, there’s an upside in interior space. Another way to compare the V2’s toe-box fit would be to do so with the 2015 Free 5.0; both feel similar in that regard. There not much to write about the midfoot fit, except that the V2’s midfoot feels snugger near the opening due to the sock-like design. 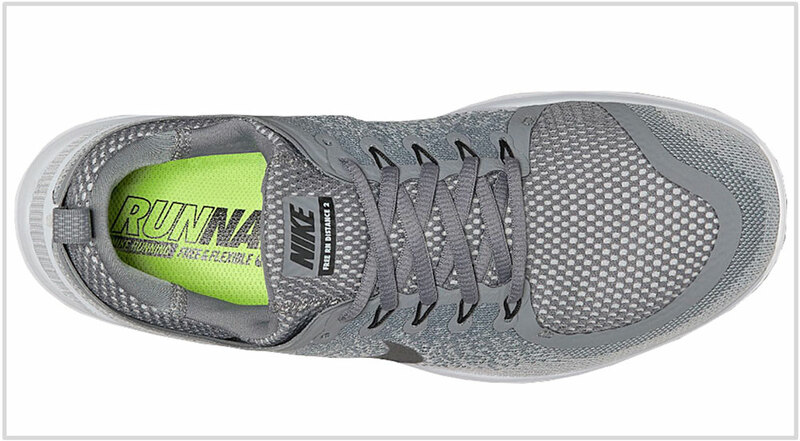 Flywire cords apply some side pressure, but sufficient insulation is provided by the inner midfoot layer. While the mid and forefoot interiors are smooth, the RN Distance V1 felt smoother due to the onesie sleeve inside. The fit update made to the heel area is worth highlighting. The closed loop design makes the Distance V2’s heel fit snugger fitting than the V1, and also, getting into the shoe requires a bit of an effort. The back part of the heel is stiffer than the V1 due to the synthetic wrap, so you’ll miss the soft, collapsible feel of the previous model. On the positive side, the heel grip is much better – something which the V1 lacked. We fail to understand why Nike chose to seam up either side of the heel collar. This is very unusual; can’t recall of any other model having resorted to this construction technique. It clearly appears that the priority here has been pattern efficiency instead of user comfort. After all, even the tongue has two flat-lock seams inside, which makes the heel seam(s) unnecessary. Running barefoot in the Free Distance V1 was a comfortable experience, but you can’t say the same about the V2. With socks though, the seams are not an issue. But why include the irregular seams in the first place? The removal of the inner sleeve not only opens up vertical toe-box space but forefoot room as well. Compared to the RN Distance V1, the V2 has a wider forefoot. Do keep in mind that the word ‘wider’ is used in a specific context here. 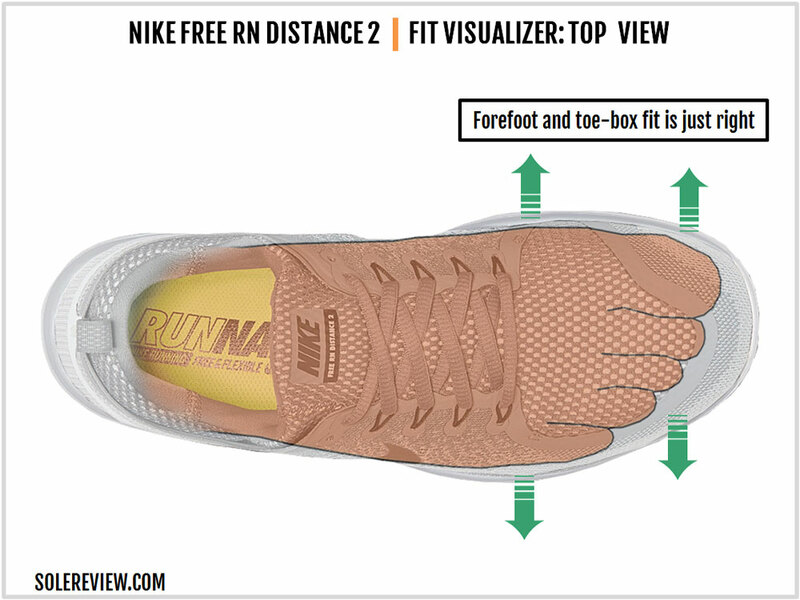 The RN Distance 2’s forefoot is snug fitting on a general scale, but wider than the V1. If there’s one shared characteristic across both the RN Distance versions, it’s that the softness is concentrated in the upper midsole area. The combination of three different kinds of cushioning agents – the insole, foam lasting and the Lunarlon layer – produces softness in the upper regions. The outsole is firmer than the V1’s design, chiefly due to the lack of articulation. The loss of deep flex grooves inhibits the outsole’s ability to splay; the heel edge is now molded solid, so the flexible crash-pad behavior of the RN Distance 1 will be missed. Nonetheless, the Free RN Distance packs enough cushioning for longer runs up to a marathon. 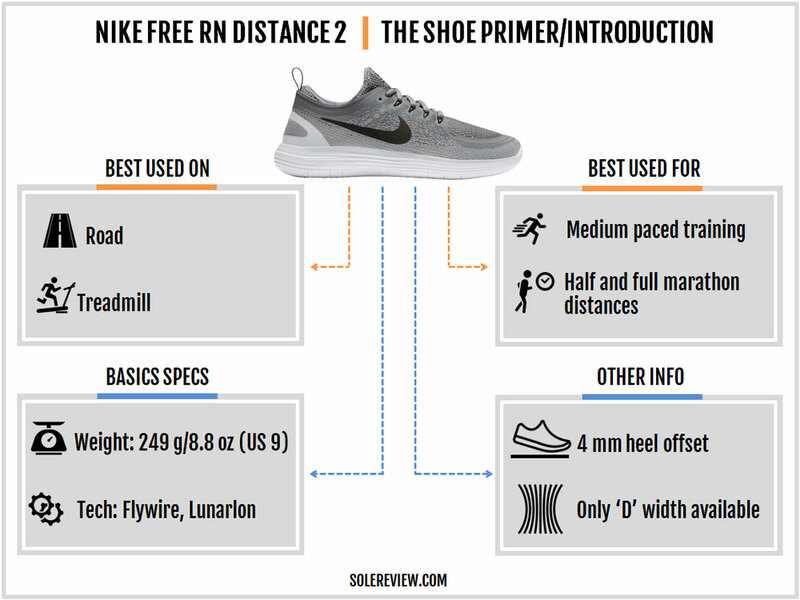 So if the reason for avoiding other minimal Free variants was the lack of the cushioning, then the RN Distance has you covered. While one gets the soft feel from the combined stack of the insole, lasting and the Lunarlon topping, a springy feel is conspicuous by its absence. 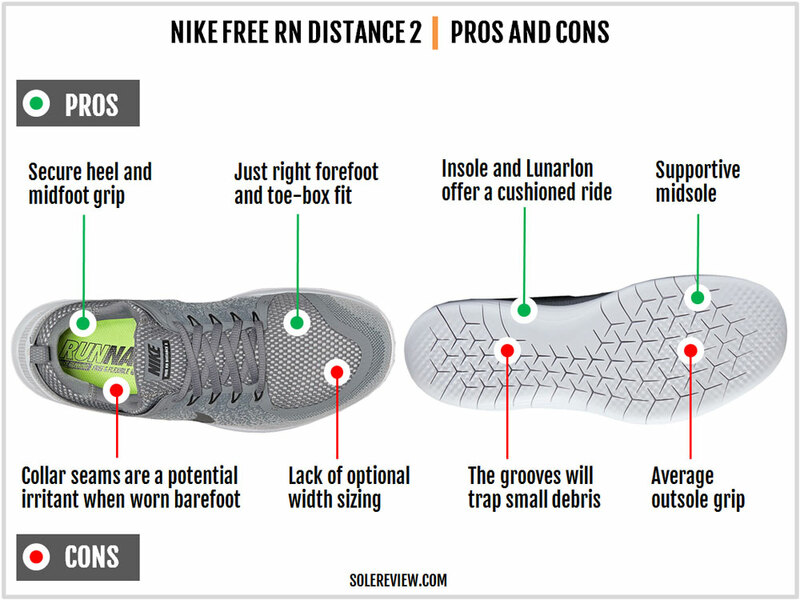 The Free RN Distance 2’s midsole does not deliver a bouncy feel; the ride has a flat sensation to it. The midsole has a balanced sidewall design which produces a supportive ride. Save for the top layer, the rest of the midsole has a firm foam density which prevents excessive compression. The heel feels stable, and so does the forefoot which has a reassuringly planted quality. The reduction of flex grooves on the outsole improves the RN Distance V2’s transition quality over the V1. The stiffer forefoot allows faster roll-offs, and the filled-up midsole makes midfoot progressions smoother. The upper fit of the V2 evokes mixed feelings. The forefoot and toe-box feel more spacious and easy on the foot due to the switch to a single-layer upper. At the same time, the strange seams of the heel collar make you wonder what Nike was thinking during the design process. Lunarlon foam, when paired with the soft insole delivers a padded ride which is also supportive – thanks to the firmer EVA base below. The RN Distance is a lightweight shoe at 249 grams/ 8.8 ounces. There are a few things about the RN Distance’s design which we don’t find appealing. First, adding two seams right inside the heel collar is uncalled for. Those seams go against footwear design best practices. The lack of optional widths is another area where the Distance could improve. 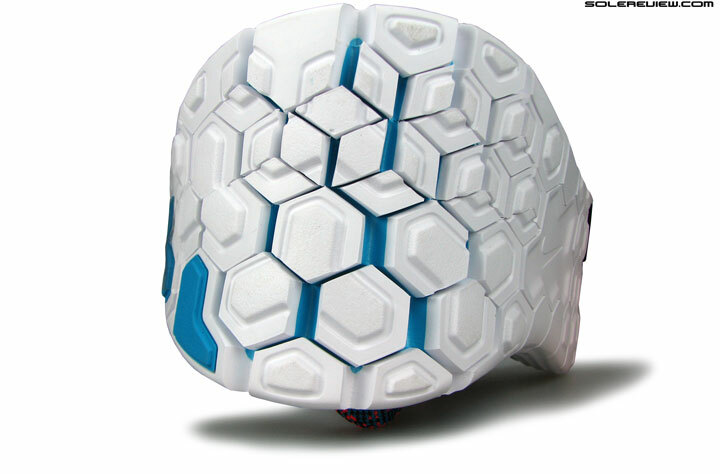 Also, the foam outsole offers average grip when compared to rubber-clad designs and even the V1’s hexagonal pod design. Among other minor things, the closed bootie design is a bit of a struggle to get into (over the V1), and the outsole has a debris trapping tendency – though not of the same severity as the RN Distance 1. 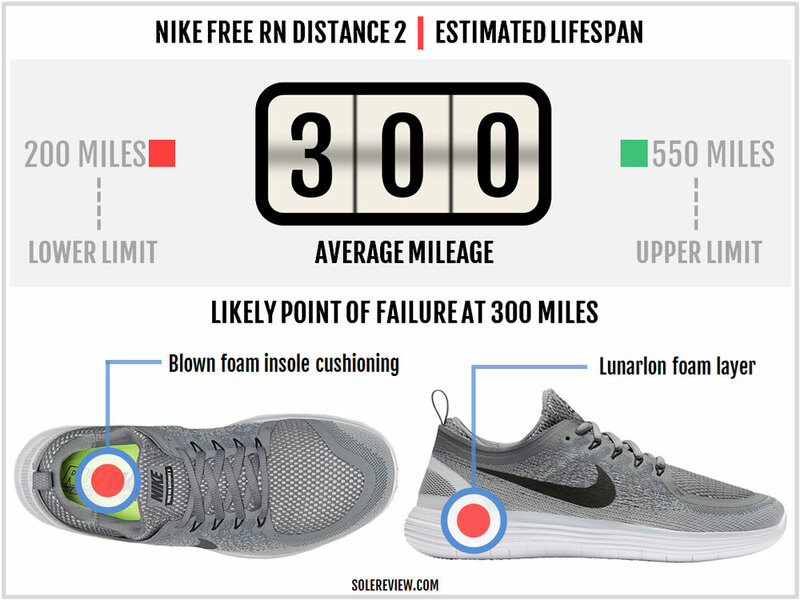 The RN Distance 2 carries forward the Lunarlon and EVA foam stack from last year, but apart from that, a lot has changed. The upper part of the midsole produces a similar cushioning sensation, but the rearfoot (edge) is firmer due to the loss in articulation/grooving. There was also a bit of softness delivered by the splaying of the hexagonal pods (including the heel crash pad) on the last year’s Free RN Distance, which now is gone. The lower midsole and outsole loses a bit of softness. There’s more room inside the forefoot and midfoot due to the elimination of the separate inner sleeve. In the rear, the heel offers a higher level of grip, and the midfoot feels snugger at the entrance of the shoe due to the closed-bootie design. The stability levels are similar to last year, and the midsole feels faster due to the firmed up ride. Both the RN Distance versions weigh and cost the same. 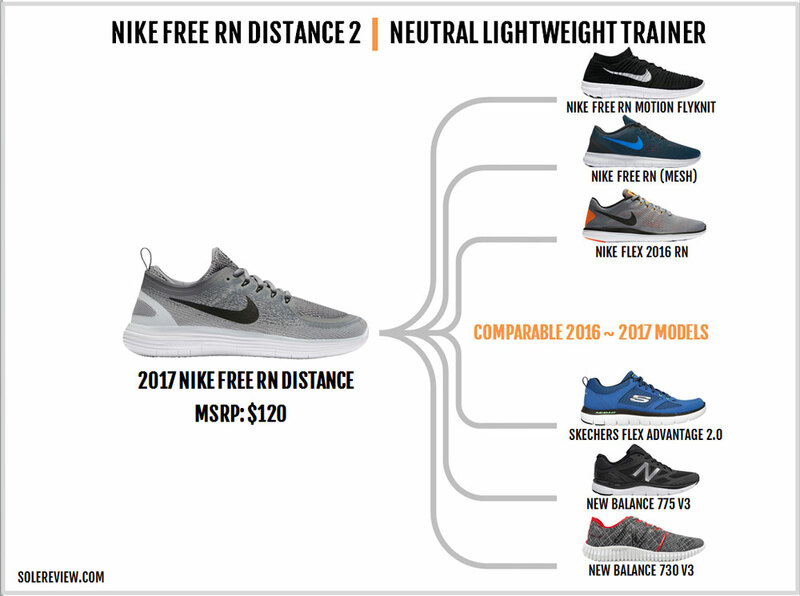 Considering that very few brands these days are into the whole minimal/flexible shoe game, most of the other models similar to the RN Distance are found in Nike’s line-up. 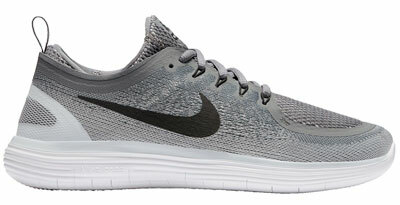 The Free RN Motion Flyknit is $30 more expensive than the RN Distance, and features Nike’s signature knit mesh design. The 4 mm drop midsole is dual-density, stacking together a soft foam core and a firmer EVA base. At the same price as the RN Distance is the RN Flyknit; this shoe has a single-density midsole with a snug-fitting Flyknit upper. Cheaper alternatives are available too. 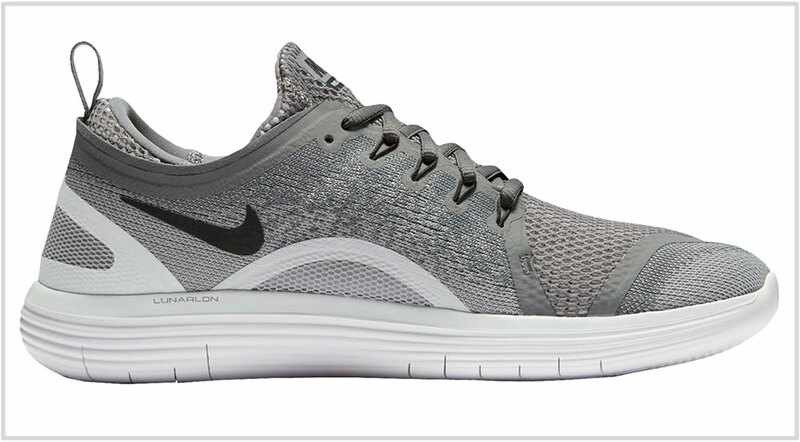 The non-Flyknit Free RN can be had at an MSRP which is $20 lower than the RN Distance. It features the same midsole as the Flyknit version, except that the upper is made of mesh and fused overlays. Both the Free RN versions have a heel-to-toe drop of 8 mm. Entry level flexibility comes in the form of the Nike Flex 2016 RN. It is priced below $100, and has a 7 mm offset on a reasonably lightweight package of 8.2 ounces. There are few options outside Nike worth a look. Skechers sells the Flex Advantage 2.0 below $100, and the shoe’s outsole design is an unapologetic facsimile of the previous generation Nike Free outsole. New Balance sells the lightweight and flexible 775 V3 and the 730 V3. The NB 730 V3 is the closest one can get to the Nike Free concept. The 4 mm offset midsole uses New Balance’s ‘Flextonic’ design, and packs ample cushioning. The 775 V3 is closer to the Free RN due to the 8 mm heel drop. And last but not the least, the Brooks Pureflow 6 is comparable at a conceptual level. It might not have the generous flexibility of the Nike Free, but the low heel offset ( 4 mm) and the underlying premise (minimalism) are shared design principles.